Baguio is a place for walking. Mind you, I reckon I walked more than 10 kilometers the whole time I was there. Trust me, if you plan to go over and reevaluate your life, go ahead and travel up north. It helped me decide what path I was going to take after the storm has passed. All that walking and thinking and a bit of people watching was rather therapeutic. Sometimes, you just got to sit back and relax. Walking, drinking hot chocolate from the nearby 7-Eleven was the killer combo for me. With my light jacket and rubber shoes on, I was ready for anything. Baguio's crisp clean air was a huge change for my system and for my body in general. Fact be told - Baguio is utterly beguiling. Eating was the least I had planned, I think I only visited 2 places? Maybe 3 if you counted 7-Eleven to the mix. 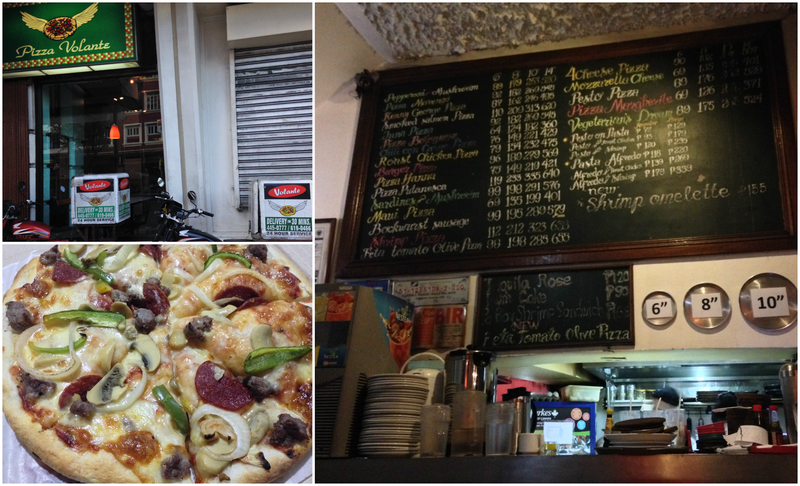 Here are some of the places, I visited during my short stint in the city of pines. Jim's is a quaint little place in the busy Session Road. After a whole days worth of walking, decided to try out some local food. It has a retro feel to it, decked with pin-up posters of women, Elvis Prestley and some iconic logos on it's walls. Jim's Retro Diner does deliver on it's retro-vibe. The interior speaks of a time when all you want to make your day better was a good burger and milkshake. I specially loved the burger, with enough spice and juicy patty. I can keep going for more. The pasta wasn't that bad too, it was rather forgettable. I also enjoyed the chocolate milkshake. Cold, sweet just enough to satiate my hunger. I passed this famous pizza place multiple times in the day as I venture back and forth around Session Road. It was charming, always filled to the brim with customers at any given time. During one of the late night walks, I decided to drop by and grab some pizza on the way home. I forgot what pizza I ordered but it was just enough to keep me full until breakfast. Easy on the pockets and definitely a place where you can hang with your friends after a long day of adventure or just to cap off the night after a long hard battle at the night market a few blocks away. The iconic, strawberry taho is something for you to try. A vendor was selling it when I enjoyed my leisurely walk around The Mansion. Certainly, it's not a wonder to eat. It's the regular taho with the usual strawberry puree mixed to it. You can opt to keep it less sugar by asking the vendor. It was rather too sweet for my liking - but a must try nonetheless. When I took the photo, I was not expecting the color scheme. Surely, I have not tried everything while I was in the city. And I certainly have to come back to try the usual flair at some of the famous food spots. Baguio, you make me want to come back for more. Beguiling Baguio | Food - you are here!